Georgia’s capital is Atlanta. Several major interstates run right through the city making it an ideal place for vehicle shipping. 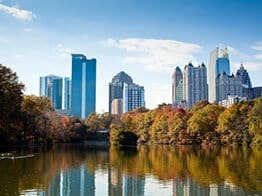 Atlanta is known for several things including the 1996 Olympics, its growing economy and historic ties. The honorable Rev. Martin Luther King Jr. was born in Atlanta. The city has a special center dedicated to the iconic civil rights leader. You’ll be able to tour the home of King, walk through Ebenezer Baptist Church where he ministered, and view the Atlanta Fire Department nearby. Atlanta, Georgia also prides itself on having a famous baseball team, the Braves, who have been referred to as America’s team. That might have been a bit of bravado from the irrepressible Ted Turner, who owned the team and then broadcast all 162 games on his cable station TBS. Mr. Turner might have been twenty years ahead of the competition on that one. Georgia has produced several celebrities and well-known figures. Jackie Robinson, the first African American to become a part of a major baseball team, was born in Cairo, Georgia. In 1955, this legendary player helped the Dodgers bring home the trophy at the World Series. But more than that, his courage and dignity in the face of racism and adversity paved the way for others to come, like Willie Mays and Atlanta’s Hank Aaron. If Robinson doesn’t keep his cool, who knows what would have been? Praise God for Jackie Robinson. Another famous Georgian is Jimmy Carter, the 39th president of the United States. The former governor and peanut farmer served only one term, but he brought peace to Israel and Egypt in the Camp David Accords. Guess what folks, that deal is still going strong. The “King of Soul,” Otis Redding, was from Dawson, Georgia. His soulful tunes of the 60s granted him a Grammy and induction into the Rock and Roll Hall of Fame. He was also inducted in to the Songwriters Hall of Fame. The Godfather of Soul, James Brown, is another music icon and legend that is from Georgia. His decades of music and dance moves have greatly influenced the sound of the music industry over the years. Hits such as “I Got You”, “I Got the Feeling” and “Say it Loud-I’m Black and I’m Proud”, are just some of the songs that contributed to his induction into the Hall of Fame. Personally, we imagine Gladys Knight’s Midnight Train To Georgia filled with shipping cars. And Ray Charles may have had Georgia on his mind, but we have Georgia auto transport on ours. The famous book and story written by Margaret Mitchell, “Gone With the Wind”, illustrated the southern life that took place in Georgia. When the movie first came out, roughly a million people showed up for the premiere. The movie was the first time anyone swore in a movie, which is kinda funny to think about now. Clark Gable as Rhett Butler said to Vivien Leigh’s character Scarlett O’Hara, “Frankly, my dear, I don’t give a damn.” Well it was shocking back then. My, how times have changed. But charging up and down I-75, Georgia car transporters create their own wind energy. There is a lot to experience and appreciate when traveling through Georgia. Choosing to use the right Georgia auto transport service to ship your car while you travel will surely serve as a convenience. Spare the long road trip or avoid having to tow an extra vehicle around. Depend on our Georgia car shippers to deliver your car to you fast! We take each car transport shipment seriously to get it done right. By dialing 800-600-3750, our toll free number, you can get more information from a Georgia car moving representative. Learn more about how the vehicle shipping industry works and how you can ship your car to Georgia. You can also visit Direct Express Auto Transport to fill out a simple form and get a free car shipping quote. We make it easy to book your vehicle shipment online. Setting up your order is a simple process with Direct Express Auto Transport.